St Ignatius says, “Tertianship is the school of the heart” (Const. 516). Indeed, after the programme finished, my heart was moved by my many experiences during my Tertianship. Among them, I want to share the two most important. First of all was the experience of the 30-day retreat. During this time, I had a chance to look back on my relationship with the Lord. I realised that, despite my unfaithfulness and failures, God loves me so much. Not only does the Lord love me, he has also protected and rescued me. The fruits of the long retreat are many, but the most essential has been to realise my disordered tendencies. This is also one of the fruits Ignatius wishes the retreatant to achieve: “So is the name of spiritual exercises given to any means of preparing and disposing our soul to rid itself of all its disordered affections” (Ex 1). In order to rid myself of them, I really needed the grace of this long retreat. The retreat gave me a deeper sense of understanding how “a Jesuit is a sinner but called and loved by the Lord”. Through my unfaithful love, many failures and sins, and my disordered affections, I realised that without God, I am nothing. It has taught me to live with greater humility. Together with Peter, I acknowledge: “Lord, you know I love you”. I feel a stronger and deeper desire to follow the Lord more closely. I had a real taste of what Fr General Kolvenbach said about the 30-day retreat: “He (the tertian) consequently lets God take hold of him anew, in the totality of his life, because God is, and demands to become more and more his only God; and the tertian accepts to be led through the paschal path of the One who wants to associate him definitively with his saving mission” (Kolvenbach, The Formation of Jesuits, 130). The second important experience was serving at the Philippine General Hospital (PGH). I chose this apostolate because it was very especial for St Ignatius and his first companions. I had the opportunity to work for the poor, the sick, the imprisoned and the marginalised during my years in the Novitiate, Philosophy, Regency and Theology. However these experiences had not been so deep and affective. Now that I am a priest, I wanted to affirm whether being with these people really brought me joy and consolation. How do I serve others with the heart of a priest? This for me was a crucial question. Through the experience of serving the sick, I learned about the frailty and limits of life (for example, meeting someone today who would die the following day), to accept my life and to abandon it more totally in the hands of God, and to understand more deeply Ignatian indifference: long life or short life, health or sickness, life belongs to God. After living with the poor in Tondo, with the people in Bontoc and especially with the sick at PGH, I feel happy. Indeed, my life has been enriched by the lives of these people, by their faith and hope. What Fr Kolvenbach said is true for me: “Contact with the poor and less favoured, living in their midst, humble and selfless service, can be priceless experiences, especially in the case of Tertians usually engaged in another type of apostolate; they can touch them in their affectivity and make them more permeable to the Gospel message of the Beatitudes” (Kolvenbach, op.cit., 131-32). “They will find it helpful during the period of the last probation to apply themselves in the school of the heart, by exercising themselves in spiritual and corporal pursuits which can engender in them greater humility, abnegation of all sensual love and will and judgment of their own, and also greater knowledge and love of God our Lord; that when they themselves have made progress they can better help others to progress for glory to God our Lord” (Const. 516). 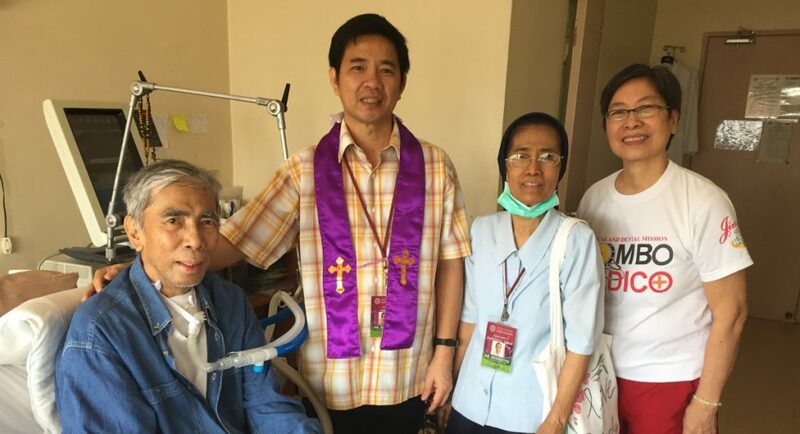 Fr Dominic Pham Minh Thang SJ from Vietnam is one of eight tertians in the 2018-2019 Asia Pacific Tertianship Programme in Manila from September 2018 to March 2019. Tertianship is the final period of formal religious formation for Jesuit priests and brothers, during which the Jesuit makes the full Spiritual Exercises again.